Exciting News To Share: Debbie Ford’s Most Personal and Powerful Work Yet! I know it’s been a while since I posted here. When I started this blog, it was my intention to post something weekly. That has not been the case. I have lots to talk about and I’m hoping you will be patient and stick with me as I work through some recent challenges. In the meantime, I have some news I just couldn’t wait to share! ::For decades, New York Times bestselling author Debbie Ford has been helping people break free from the emotional baggage that has held them hostage. 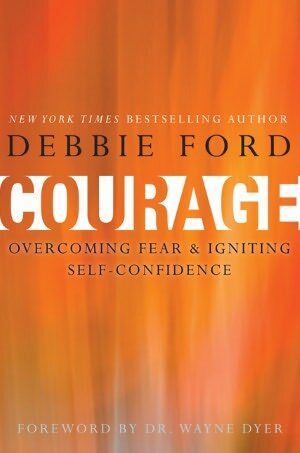 With her new book Courage: Overcoming Fear and Igniting Self-Confidence, she offers her most personal, powerful, and potent work to date.—a proven process for overcoming insecurity and fear and unlocking the enormous courage that resides within. Debbie Ford has excelled in the school of life, overcoming drug addiction, divorce, a heartbreaking betrayal, and a grave cancer diagnosis. How did she find the courage, confidence and strength to become one of the world’s foremost thought leaders? She tells us in this book. And she outlines a powerful process to help you become all you have wanted to be. COURAGE is a book about transforming fear, unworthiness, insecurity and powerlessness into courage, confidence and emotional freedom. This book outlines a transformational process that will deliver you to a version of yourself and your life that will inspire, excite and exhilarate you. In this book, you will discover how to accept and transform your flaws, your misgivings, your weaknesses, and your fears. You will learn how to be confident, stand in your strength, and feel great about your life. You will activate the seven guiding principles of courage to become strong, powerful, confident and courageous. And you will experience a new kind of courage and a new kind of confidence that will propel you into an infinitely beautiful and inspiring future. I promise you that when you recognize the strength, power, and freedom of the courage that has been present in you all along, you will realize that you have the power to accomplish your heart’s desires. If you haven’t read any of Debbie Ford’s books, I can assure you this will be life-changing! It is a privilege to support her work as she has had such an impact on my life. I will be back to my writing soon. But until that time, I encourage you to check out Courage. I know you’ll be glad you did.